Any one familiar with the game of baccarat will know that it is possibly the easiest casino game to play (with a slim house edge to boot on Banker bets!). You simply choose your bet, of which there are only three (Player, Banker, Tie) and let the dealer do the rest. In-running baccarat, shown at left played at bet365‘s live online casino, takes a simple game and complicates it quite a bit and is probably not the best variation for newbies to start their baccarat adventures with. 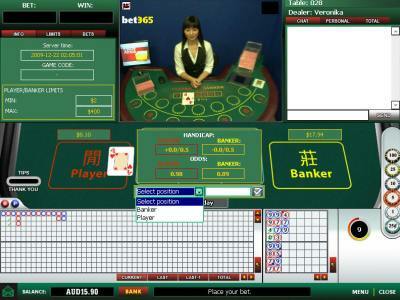 As the name suggests, the game allows for bets to be placed in-running, or during the course of the deal. Opening Player, Banker, Tie bets may be placed. But then after each card is dealt a further betting round, with house calculated handicaps and payouts are offered. It takes a bit of getting used to and like I would suggest maybe playing standard baccarat first before giving this game a go. In-running live baccarat is offered by Playtech licensee casinos taking games served out of Playtech’s Asian dealer rooms. Our favorite of these is bet365.